Discussion in 'Studio Scale Models' started by Barnstormer, Dec 31, 2005. If anyone has come across this part while working on other projects, a tip would be much appreciated. Thanks for looking. That reminds me of aircraft landing gear for some reason. StevieLewis, the other guy who's doing this build, has been using some parts from the 1/148th Tomcat - there are other Tomcat parts used - but he doesn't have a final match. an exhaust manifold part from some multi-cylinder engine? Wow!...I just came across this thread while checking out past topics here on RPF. We did eventually ID that part, its from a 1/48th scale F-16 landing gear. Just to let anyone interested in this yet, since the last post to this thread, I have basically got a primer coat of flat white on this model. It still isn't finished yet...7 years later!!! unsure I'll see if anyone is interested in seeing any pics of this before I post any to what is basically a "dead thread". Oh, btw, the link in the first post by Barnstormer for Starship Modeler is no longer useful as Starship Modeler only keeps threads active for about a year, or until it works it's way to the end of page 4. A thread is not dead if you have some work to show off. The pics are quite large. Click on them to see full size. The original starship modeler thread link is long dead. I would like to see the parts breakdown. I was holding off on commenting until I had something less retarded to say than that it looks great and you're doing an awesome job. People here work so hard and do such great work, it seems a pity to not make an educated, detailed response as to how great they are and how awesome the work they are is. Are you going to paint it "realistically," standard starfleet for filming colors, or stay true to the studio model and use all the day-glo for windows and other glowing bits? Yeah that does look awesome! I'd love to see a part list breakdown as well. Thanks guys. I'll get a parts breakdown listed, as well as seing if I can post some of the early pics from 2005 here, so you can see how it has evolved and changed over the years. I hope to paint it up in standard StarFleet colors. The "day-glo" colors and "gold" shiney items were done that way for photography purposes on the set, which I'm sure many on here were aware of. The "day-glo" colors and "gold" shiney items were done that way for photography purposes on the set, which I'm sure many on here were aware of. Yup, but we're in the studio scale forum, so it actually was an option to ask about. Just came across your update, and I really love what I see! I was hoping to download some of the pictures from when I started this build way back in 2005 from my PhotoBucket account, but they decided to change the format there. Right now I can not download any of my pictures from there. Even right clicking on the photo doesn't bring up the "Save picture as..." link. I guess I'll have to wait until PhotoBucket gets their redesigned site working properly before I can download any of my pictures from there. I'm working on the parts list of the kits I used for all the greeblies as well as the main ship parts. Hope to have it posted here in a day or so. The Centaur was always my favorite of the DS9 frankenfleet, despite the mixed scales. You definitely did it justice, particularly with all the greebles. Excellent job! Great to see this thread again. I stopped on mine due to not figuring out the last few parts. Hopefully we can all knock this sucker out! Thank you 137 Gebirg and timeslip. I really didn't think anyone had much interest in this ship since it was so briefly seen in DS9. Hopefully once it gets warm outside again (above 50 F and low humidity) I can get a better coat of paint on this build and finally get started painting it in standard Starfleet colors of that era. 1. 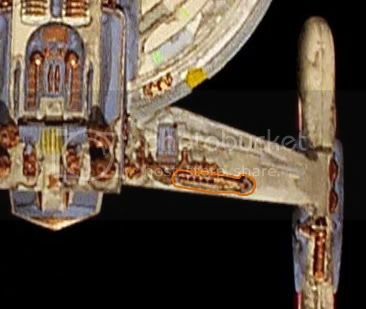 Excelsior - Primary hull, aft Shuttle Bay, 4 Lower Warp Nacelles, 2 aft Torpedo Launchers. 2. Reliant - Main Bridge, Weapons Pod/Rollbar, 4 Megaphaser Tips, 4 Pylon cover Plates, aft Bridge Docking Port. 3. Greeblies - Maquis Raider Grills (2 medium length and 1 short length), 3 Enterprise - B Dekoids, K'Tinga Port/Starboard Shield Generators, K'Tinga Warp Nacelle End Caps, 20mm Flakvierling 38 parts, Leopald Railway Gun parts, F-16-A Landing gear parts and outside Main Wheel/Tires, F-14 Tomcat Main Landing Gear, Panzer III/IV Individual Tank Track (22). This is the best I have come up with over the nearly 8 years I have been working on this build. It's a far cry from what I started out with back in 2005 with what was then an all resin greeblie add-on kit. I have pics finally from then if you all would like to see how the parts changed over this period. Let me know and I'll add them. I would actually be interested in a parts map of the build. I recognize the parts from all the Trek kits you mentioned, but the other pieces from the non-Trek kits are a bit more elusive to recall their shape.